← Aruba Jamaica ooh I wanna take ya! It’s 3.30am on our first night after leaving Aruba, and I’ve just started my 3- hour watch. 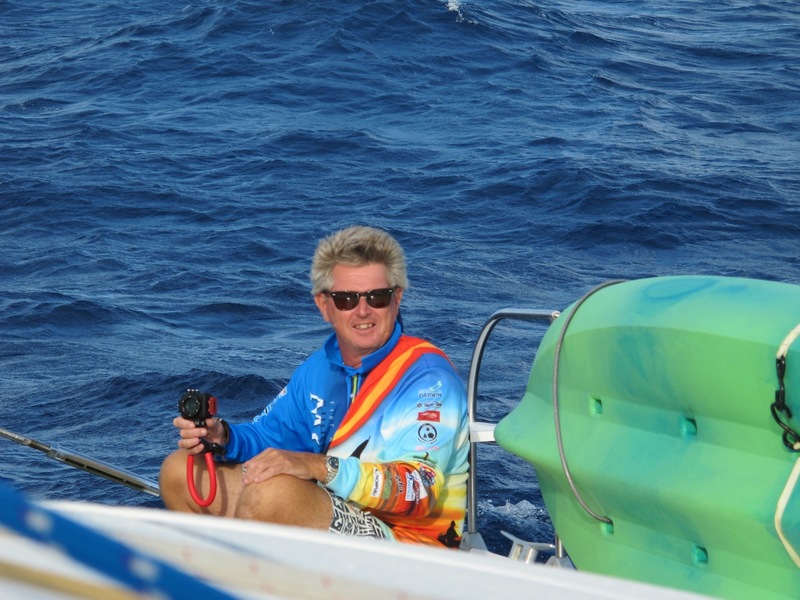 The wind is steady at 20 kts and we’ve got a reef in the main and the jib partially furled. There’s no moon tonight so it’s inky black out there, but the stars are putting on their best display, the Milky Way a glittering belt encircling us above. I listen to the familiar creaks and groans of Toucan as she rides over the swells and watch the little blue triangle (that’s us) marching across the chartplotter screen. Suddenly two orange monsters appear on the screen, one crossing our path ahead, the other coming side-on. 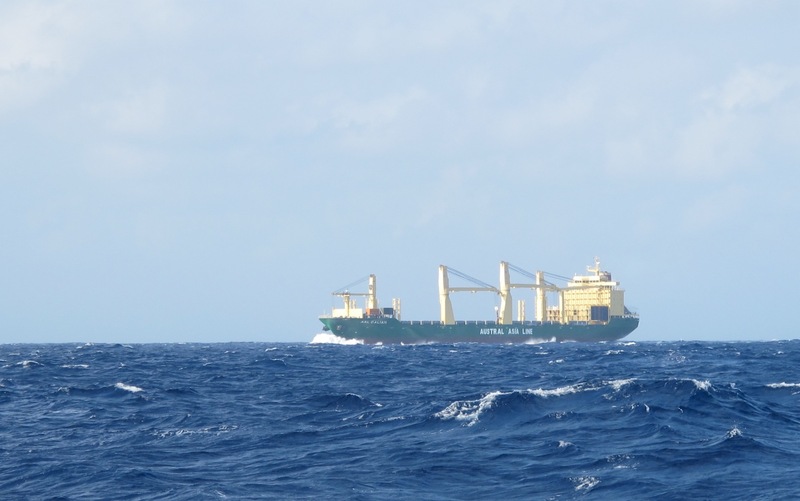 These are the ‘targets’ that our AIS (Automatic Identification System) picks up, better known as bulk cargo carriers, plying their trade across the oceans of the world. They’re big and fast and I certainly don’t want to be the meat in their orange sandwich. There’s a lot of traffic in this stretch of water because of the proximity to the Panama Canal, so the night watches for all of us on this passage could generally be described as periods of serenity interspersed with bursts of adrenaline as we dodged and weaved our way around the giants, seemingly intent on using Toucan for target practice. Just to make life more interesting, it seems we haven’t mounted our AIS aerial high enough, because it’s only picking up the targets when they’re about 5 NM away – not much time to manoeuvre when they’re travelling at 20 kts per hour! Traditional maritime law states that power gives way to sail, but in practice you really wouldn’t want to test it against an 800ft lump of steel travelling at 20kts. So we mostly adjust course where we can, and are ready to call them up on the radio when we can’t. 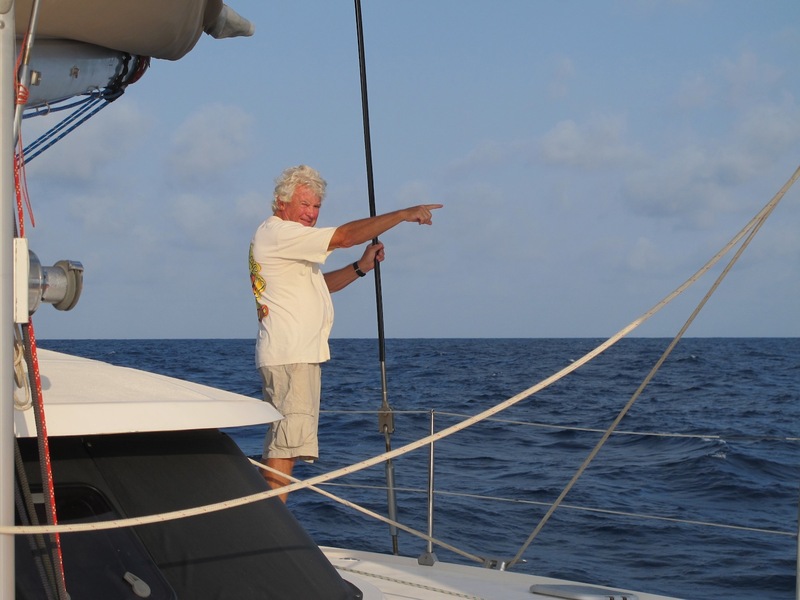 We left Aruba in the afternoon of Saturday 21st March, hopefully with a good weather window to get across this notorious stretch of water, supposedly the fifth roughest patch of water in the world according to Jimmy Cornell. 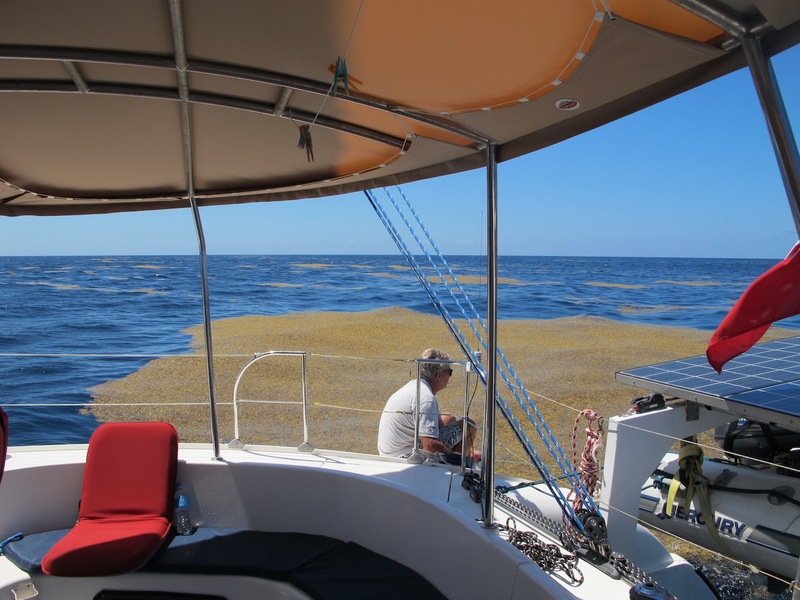 I’d been monitoring the weather forecasts for the past 6 weeks and they were alarmingly consistent – 30-40kts in the daytime, 40-50kts at night with 12-20’ seas. To say that I was a bit apprehensive about this passage would be an understatement. So when our weather guru, Chris Parker, predicted a significant decrease in wind across the entire Caribbean we knew our chance had come. Our first afternoon was glorious:- bright sunshine, flat seas, beam-reaching at 9-10 kts, the stuff dreams are made of. 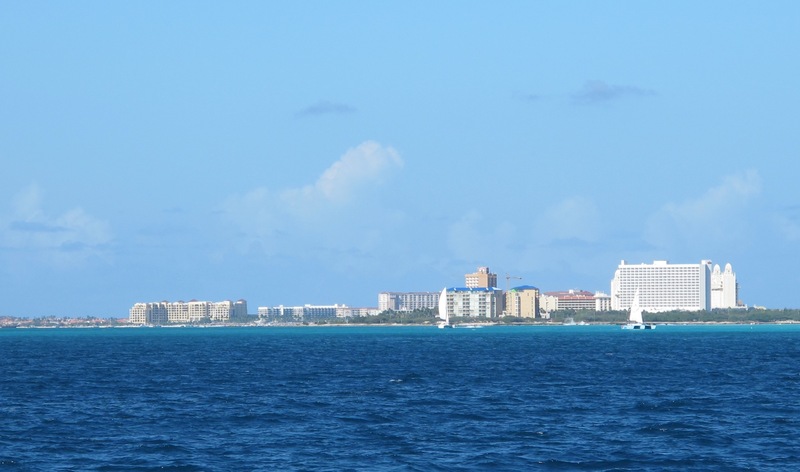 We gradually left the industrial docks and the big hotel complexes of Aruba behind us and headed north-west, out into the wide blue yonder. I’d pre-cooked a couple of meals in case it was too rough to be messing about with knives in the galley but our first night was very pleasant (despite the orange monsters). We failed miserably in our fishing tally, despite putting lines out most days. The first day there was too much weed, and then on the second day something monstrous managed to bite through the wire trace and lure. That’s two silver spoons gone to the fishes now. I hope they appreciate them. wow, that’s a lot of weed! After skirting around the shallow shelf north-west of Aruba (where the seas can kick up) we tried to sail the rhumb line to the San Blas Islands, but the wind was directly behind us, so we ended up having to sail angles, first towards the coast of Colombia and then away, criss-crossing our rhumb line and adding a few miles to our passage. As we got closer to the coast around Santa Marta the wind and seas began to pick up until we were eventually down to our 3rd reef in the main and just a scrap of jib out. The most we had were gusts to 32kts and 3 metre seas, but it certainly left us in no doubt that this would not be a pleasant place to be in ‘normal’ conditions. It felt like we were tiptoeing past a sleeping dragon, hoping it didn’t open a lazy eye and spot us in it’s lair. The combination of the wind funneling round the coast, and the huge mountains of Colombia certainly make it a place to be reckoned with. There was a tinge of regret as we sailed past Cartegena, a place we’d heard so much about and we’d love to have stopped. But time had got away from us, and we couldn’t afford to be too much later getting through the Panama Canal and into the Pacific. As we sailed away from the coast, the seas and wind eased. We spent our time off watch reading, sleeping, and playing with Go-Pro cameras. On watch we continued to play dodgems with the big boys going to and from Panama, and calculating and re-calculating our arrival time into San Blas. There was no way we were going to attempt an arrival in the dark due to the reefs and the inaccuracies of the electronic charts – apparently 14 yachts came to grief on off-lying reefs here last year, and already 4 yachts have been lost this year, according to the Caribbean Safety and Security Net – all due to a combination of attempting night entries, crew fatigue, and inaccurate charts. Luckily we didn’t have to stand off, as we arrived almost exactly 4 days from when we left, at 3.30pm on Wednesday 25th March. The sight of all those palm-fringed islands with sandy beaches was very welcome indeed. It’s great to have that passage under our belts, and to have crossed the Caribbean Sea. 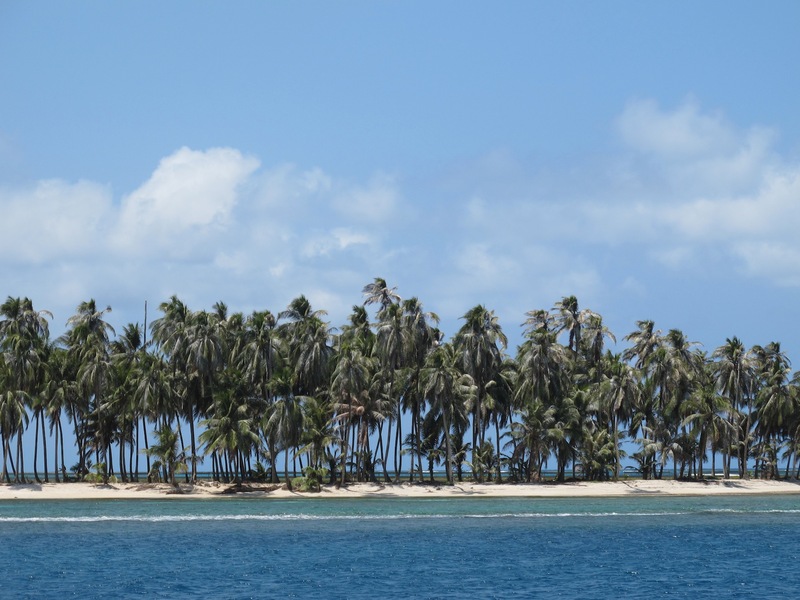 Feeling a rather pleasant sense of accomplishment, we’re now looking forward to an adventure of a different kind in the San Blas Islands. I think we’re going to like it here! Hope all going well – through eh Panama yet? As usual great Blog from both of you! I feel very insignificant sitting here in my cosy house in Nn Ireland! Our Spring not really arrived as yet – still got cold NE winds – roll on summer. Michael & Margie off on their travels tomorrow and they are here on 7th May – 2 nights with me and then 2 nights with Anne. looking forward to seeing them and catching up on all the Oz news. Always look forward to the latest episode in your exploits- not a little bit jealous! Do have to ask though where did Bruce get the shirt is it the latest in high vis. Hi guys, yes the new Toucan Rasta colours!! How’s the cruising plans going? Your posts are great, especially the humour around difficult situations with Immigration. Well done, another challenge ticked off your list…I really enjoy these episodes, better than TV! And you’re somewhere gorgeous again! Happy sailing. We’re off to Port Stephens race week, sailing up tomorrow (I have my tablets!) but it’s not going to look like that!